Bangladesh Land Port Authority Job Circular 2018 has been found my website. Bangladesh Land Port Authority (BLPA) has been published a new recruitment job circular on the daily newspaper and their official website www.bsbk.gov.bd. 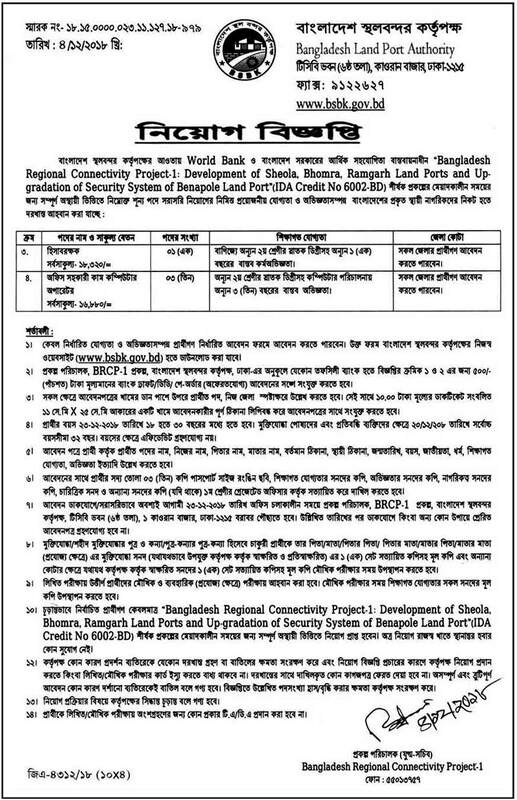 Bangladesh Land Port Authority BLPA job circular 2018 also found my job-related website. According to Bangladesh Land Ports Authority, an autonomous body under the administrative control of the Ministry of Shipping was created by Government of Bangladesh. Bangladesh Land Port Authority Job Circular 2018. ■ Job Title: Assistant Director (Traffic), Accountant Officer, Audit Officer, Medical Officer, Computer Operator, Office Assistant, Warehouse master etc. Bangladesh Land Port Authority (BLPA) under Benapole Land Port started operation in 2001. Other three land ports Teknaf, Sona masjid and Hill have gone under operation in 2004, 2006 and 2007 respectively. These three ports are being operated on BOT basis by the non-government operators who have invested the huge amount of money in this sector. Bangladesh Land Port Authority (BLPA) also generated employment opportunities for more than ten thousand families directly or indirectly. The rest nine land ports will be brought under operation in phases. Bangladesh Land Port Authority (BLPA) has been published in many categories of job recruitment. Bangladesh Land Port Authority Job Circular 2018.